Tavares Group Consulting and Kuzuka Ltd. prepare to launch the Sustainability Toolkit- A Practical Guide to Integration. - Tavares Group Consulting Inc.
Tavares Group Consulting and Kuzuka Ltd. prepare to launch the Sustainability Toolkit- A Practical Guide to Integration. Tavares Group Consulting Inc. and Kuzuka Ltd. are preparing to launch an innovative new tool that has been developed as a means to address a critical gap in sustainability implementation. While widely-recognized guidance documents that define social responsibility (e.g. ISO 26000) or detail how sustainability should be reported (e.g. Global Reporting Initiative) are currently being used today, many organizations wishing to ingrain sustainability and corporate social responsibility within their businesses are still left asking “where do we begin?”. The Toolkit, which includes a guidance document and an associated Action Plan and Assessment Tool to manage and track progress, has been designed to fill this sustainability implementation gap. The Toolkit’s methodology is a synthesis of globally recognized approaches to sustainability and systems-based management such as ISO 14001, OHSAS 18001, and ISO 26000. Given this fact, the Toolkit is based on proven and practical processes that many organizations are familiar with and is applicable to all sizes of organization across various industry sectors. 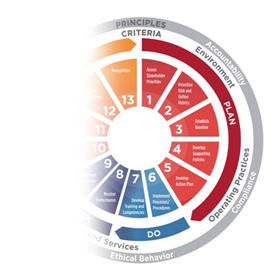 The Toolkit, which includes a guidance document and the Action Plan and Assessment Tool is unlike any product or service currently available to organizations. “We developed the Toolkit to fill a gap in the availability of resources for organizations to use when implementing sustainability initiatives. Before the Toolkit was developed very little was available for organizations that were in the important implementation phase. The Toolkit provides organizations with a practical and innovative resource that combines proven system-based approaches with the core principles and criteria of sustainability” explains Stephen Boles, President of Kuzuka Ltd. Currently, the Toolkit is in beta phase testing, with organizations across various sectors working through the Action Plan and Assessment Tool component of the Toolkit to manage their sustainability goals and programs. Stay tuned for the official website, which is set to launch in early September 2013. Interested parties are invited to attend the Toolkit’s introductory webinar. For more information, click here. Also, registration for the Sustainability Toolkit: A Practical Guide To Integration 4 week online course will be open soon. To request more information about the Toolkit, please contact us.